These medium sized (approximately 1.5") scorpions are found under rocks in northern Arizona near Wupatki National Monument at approximately 6000 feet in elevation. This area is within an hour of Grand Canyon National Park. It is a rarely seen species of scorpion. It took diligence to find it. We looked under at least 500 rocks to find one individual. It was found by my friend Melissa who was quite proud of herself. This Arizona scorpion is the most wide ranging scorpion in the US. It is found as far north as Montana and Canada. 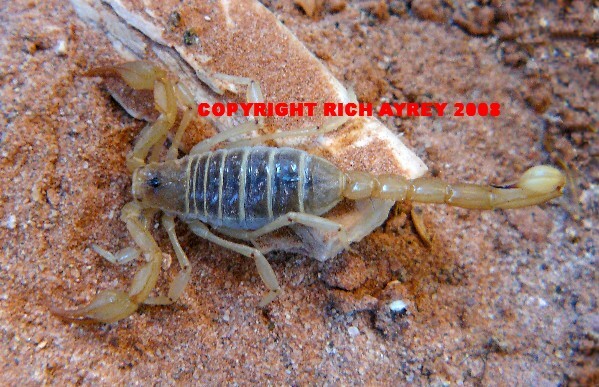 We are happy to have this Arizona Scorpion pic for you.